Paul Hessburg didn’t come to Missoula to scare folks. He came, Hessburg told his audience of several hundred local leaders, to make them feel more powerful as they learn to live in a changing landscape. Still, he didn’t mince words. “There is no future without wildfire, and no future without the smoke that comes with wildfire,” the U.S. Forest Service researcher told the room filled with Missoula real estate and insurance agents, firefighters, public and environmental health officers, politicians, climate activists, foresters, builders, university students, neighborhood organizers and more. 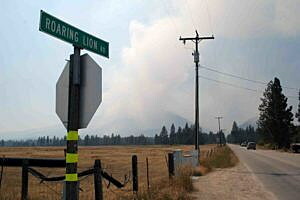 “It is critical that we as homeowners and community leaders recognize that it is our responsibility to influence the way we manage our fires and our forests,” said Hessburg, who is touring western Montana, Idaho, Washington, Oregon and British Columbia this spring with his 70-minute “Era of Megafires” presentation. A rapt audience in the University Center Theater watched and listened as Hessburg, who works out of the Pacific Northwest Research Station in Wenatchee, Wash., described the changes wrought on Western forests by aggressive fire suppression, intensive logging, homebuilding in the wildland-urban interface, and – now – climate change. The statistics set off all sorts of alarms. 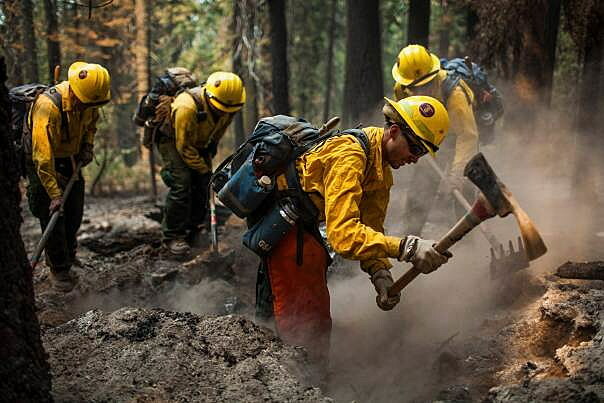 Across the West, “megafires” – those that burn 100,000 acres or more – are increasing in number. The rate of growth, in fact, is exponential: in acres burned over the last 30 years, and in structures burned (with as many as 3,000 homes and outbuildings lost per wildfire). 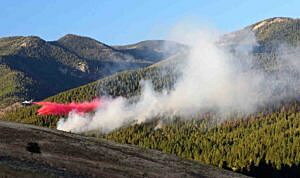 Where the Forest Service once spent 17 percent of its budget on fire suppression, it now spends 57 percent – and the percentage just keeps getting higher. And those aren’t the only costs, Hessburg said, drawing on the example of 2015, when $2.1 billion was spent on wildfire suppression. That’s an impressive number, he said, but it’s only part of the story. When you add in the cost of rebuilding structures, lost business revenues, and replacing and rebuilding infrastructure, the cost increases by 24 times. So the true cost of wildfires in 2015? $50 billion. And that’s not even what Hessburg wants his audiences – he’ll be on the road until July making the presentation – to remember. He wants them to think back and see the faces and stories of ordinary people whose lives were upended by a wildfire they never expected. In Hessburg’s hometown of Wenatchee, one of those homeowners was Scott Marboe, who watched a wildfire that was distant at 2:15 p.m. crest the hill behind his house at 8 p.m. and lob a fireball onto his neighbor’s house, which exploded in flames. Marboe and his family could not bring themselves to rebuild in their burned-out neighborhood. He could only hope that one good thing came from the ruins of his life. Fire had a starring role in the landscape for millennia before humans started disrupting things. Every living being’s life history was shaped by fire. Hessburg told a few of the stories: how ponderosa pines grew thick skins to survive the frequent, valley bottom ground fires that thinned the understory and left the big trees; how pileated woodpeckers grew to rely upon charred snags for bug meals and nesting cavities; how lodgepole pine cones open only after a fire, bursting forth with the seeds of new life; even how trout depend upon the landslides that follow an intense wildfire to deliver woody debris to their streams, creating deep holes and hiding cover. Native Americans understood and respected the role of fire, Hessburg said, and “were capable fire managers.” They learned to intentionally set fires to kill insect pests, create pastureland for their horses and to ward off massive uncontrollable summer fires by burning the grass and understory in spring and fall. Historic landscapes of the Interior West were a patchwork of grasslands, widely spaced forests at lower elevations, sparsely vegetated south-facing slopes, thickly forested north-facing slopes, and rarely burned upper-elevation thickets. But white settlers didn’t understand, or respect, the natural role of fire, Hessburg said. Almost immediately, they turned things upside down. Cattle herds of up to 100,000 animals eliminated the grasslands that once carried fire across the landscape. Aggressive timber harvests took out the largest, thick-skinned trees, leaving behind the tiny diameter trees most susceptible to fire, insects and disease. And when the Big Burn of August 1910 charred more than 2 million acres in two days, wiping out entire towns in northern Idaho and western Montana, the fledging Forest Service embraced a new national mission: firefighting. It took 25 years, Hessburg said, but by 1935, the Forest Service was adept at “holding fires at bay,” effectively eliminating most fire from the national forests until the mid-1980s. Then nature started correcting the balance, and wildfires began their return to the forests, growing ever larger and ever more difficult to control. Firefighters still controlled 98 percent of new starts, but those that got away started entering the “megafire” zone. And humans weren’t finished with the disruptions, Hessburg said. They started moving “outside of town,” into what is now called the wildland-urban interface. Just as fires started burning bigger and hotter, people started living in the forest. “As homeowners, we must understand that we have a responsibility in all of this,” he said. Then came what may be the largest, landscape-altering issue: climate change. “Climate warming is having a huge effect on megafires,” Hessburg said, pointing first to the example of last May’s wildfire in Fort McMurray, British Columbia. David Peterson, a climate scientist at the University of Washington, has studied 100 years of fire history in the western United States. He believes the dry Intermountain West will experience two to three times more fire per year by mid-century. Already, the wildfire season is 40 to 80 days longer. “We are going to experience a tremendous change,” said Hessburg. “There will be a long period of adjustment. We have a lot of fuel buildup in these forests. We’re going to see intense crown fires that cover a lot of area. Firefighters and land managers need a larger toolbox – and need their communities to embrace and participate in implementing the change, he said. “Fire suppression alone is an incomplete solution,” he said. Hessburg’s larger toolkit includes the widespread use of prescribed fire – intentionally ignited during the spring and fall; mechanical thinning of trees in forests where a lack of fire has created highly flammable thickets, designed to imitate the mosaic of a fire; homeowner actions to reduce the fire danger around their homes and on their private forests; and the use of “managed wildfire” – where firefighters “steer” the flames into areas that need burning. Each of those tools, of course, has detractors and drawbacks. In his home state, Hessburg and others are pushing for – and succeeding in getting – exceptions to air-quality rules for springtime and fall burns. But they’ve only scratched the surface of what is needed to truly make a difference, he said. No logging is no answer, though, he said. Homeowners have significant responsibilities on their own property, but often don’t act until fire is knocking at the door – which is too late. Twelve years after moving into their home, Rolfs and her family took action, hiring a forester to develop and implement a management plan that included thinning and prescribed burning. On public land, the onus is on foresters and firefighters to start “managing” fires, Hessburg said, and they need to have the “social license” to actually let some of those previously suppressed fires burn – albeit in directions determined by firefighters’ actions. Managed wildfire, prescribed fire and forest thinning are all tough sells with the public, Hessburg conceded, when quizzed about “social license” by the audience. But the alternative is more fire growth, more destroyed lives and community upheaval and the compounding problems created by global warming, he said. Does each community have to experience a megafire before citizens and leaders are motivated to action? asked one member of the audience? Paul Hessburg will present “Era of Megafires” from 6-8 p.m. on Wednesday, April 26, in the Lincoln Community Hall in Lincoln; and from 6-8 p.m. on Thursday, April 27, in the Seeley Lake Community Hall in Seeley Lake. Sherry Devlin is a longtime Missoula journalist and writer for Missoula Current.